I kept thinking that the Basin Zim water fall is all we got in Hinche as far as tourism is concerned... Little did I know... There was a tourist destination right under my nose! I arrived in the city of Hinche yesterday and many people are talking about the future of tourism in Hinche and Bassin Zim... It is not a wish anymore, there's something happening over here. Believe me, when I thought of tourism and tourist destinations in Haiti, Hinche, although my hometown, was not in my list. I am trying to understand it myself but let me tell you what I am hearing since I arrived in Hinche last night. I asked my cousin: "Poukisa mwen we y'ap dekale ancien legliz katolic la konsa-a?" He tells me the old catholic church in Hinche is being restored to it's original BRICK look inside and out. Soon tourists will be flocking to Hinche to visit the old cathedral that Nicolas de Ovando himself built back in 1503. Yess... 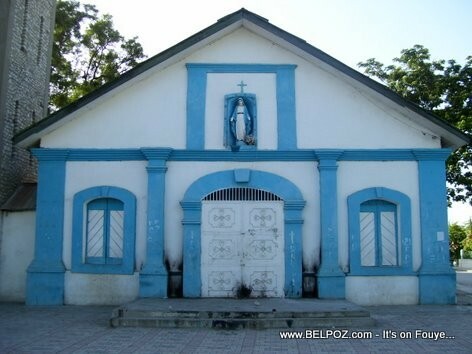 The old Catholic church in Hinche in Haiti is 510 years old! BASIN ZIM as a Tourist Destination! Big thanks to all who are making the decision to make this happen. I love you already! I do not know why you are so surprised, it is the whole country that is a tourist destination. We have not had any government and/or national organization working hard in promoting our monuments, sites, waterfalls, etc. We do not even do "internal tourism", that is the reason why we are so ignorant about our resources.